‘Tis the Season and the end of the year! Here’s a rundown of the albums that Dreamspider Publicity publicized in 2018 in order of release date. Please do keep listening to and supporting live and recorded music! THANK YOU to all the artists, writers, DJs, listeners, and concert goers!! Cheers and have a fantastic Holiday Season! 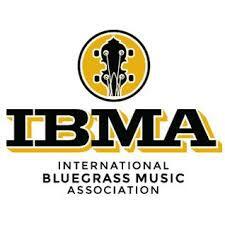 International Bluegrass Music Association (IBMA) Momentum Award for Industry Involvement! .. AND Woody Platt from Steep Canyon Rangers is nominated for IMBA Momentum Award for Mentor! Asheville’s rockin’ out IBMA this year! Very cool!! I just found out I won the editors choice for the Relix Magazine Fan Photo Contest for my photo of Peter Rowan and Ronnie McCoury at Suwannee Springfest!!!! “What is Is” Ep. 1: Publicity, Networking and more! Here’s a video of Joe Kendrick’s “What It is” discussion I was part of on Wed, Feb 27th, 2013 with Carol Rifkin and Amy Jones on Iamavl. We talked about publicity, social networking, creativity, and more! 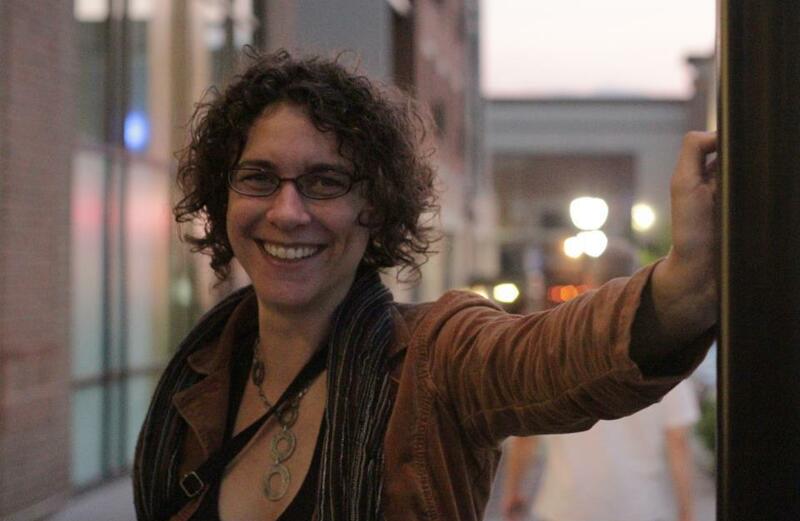 Here’s a fun and informative podcast interview with Dreamspider Publicity‘s Erin Scholze, a national music publicist based in Asheville, North Carolina. In this podcast interview, SoConvo asks some great questions that will allow you to get to know what she does more in depth. 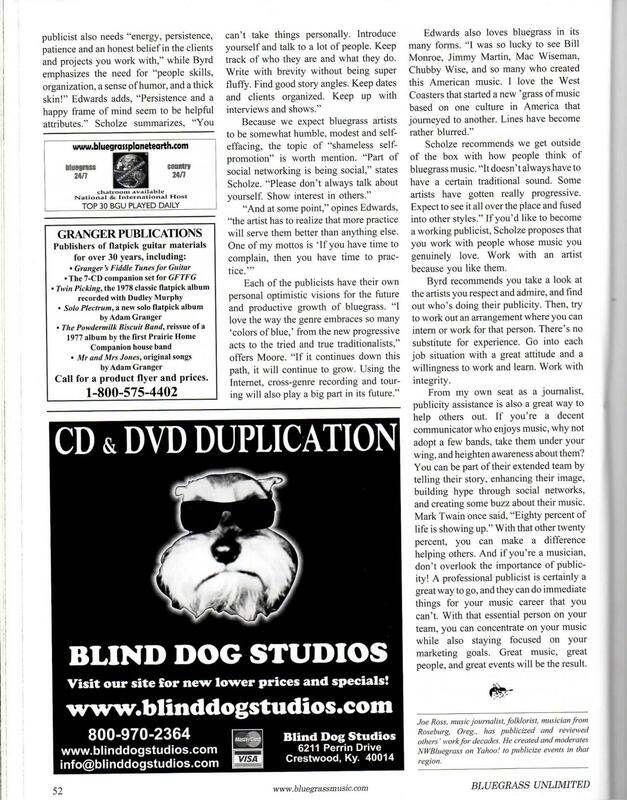 Being a musician without the proper publicity can be a challenge. Erin discusses how she walks each of her clients through a custom evaluation and steps to make their campaign successful. Erin Scholze. Photo By Anthony Harden. 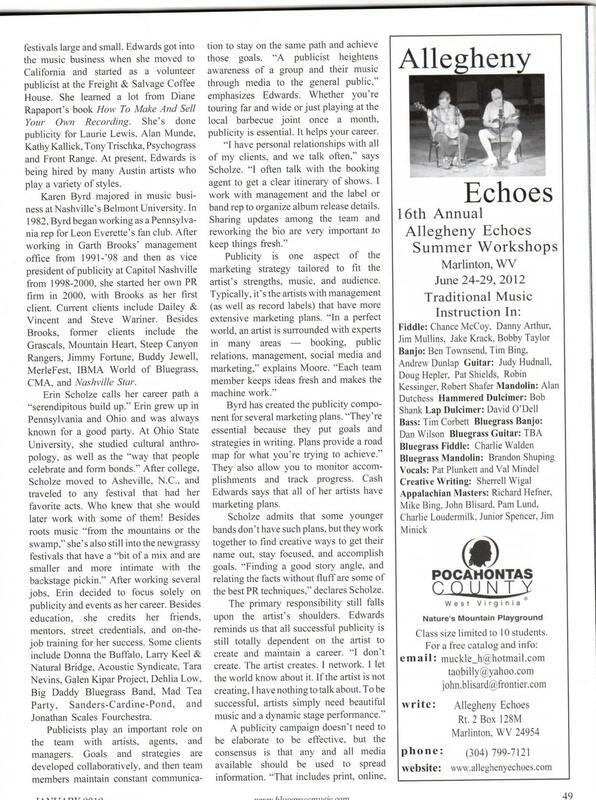 Reprinted by permission of Bluegrass Unlimited Magazine. Written by Joe Ross. 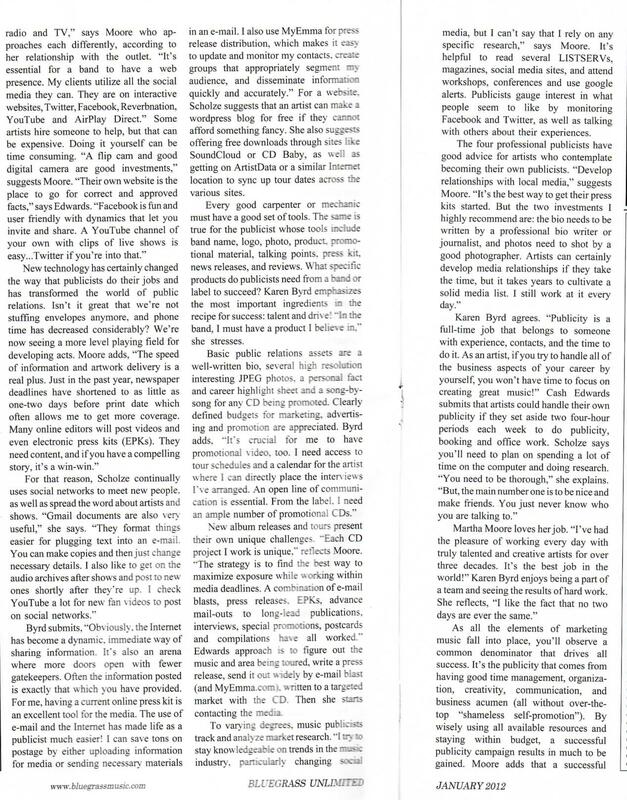 This article was originally published in January 2012. 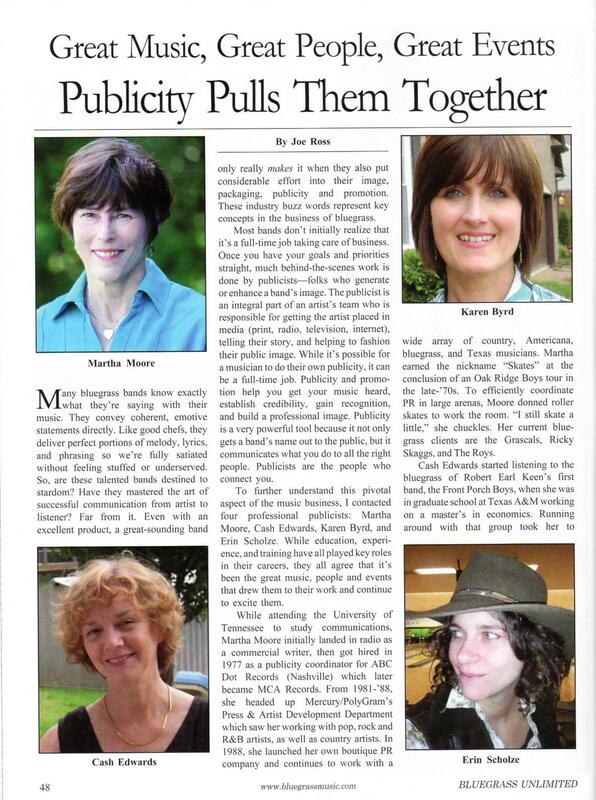 Bluegrass Unlimited’s Joe Ross interviews with Martha Moore, Cash Edwards, Karen Byrd and myself (Erin Scholze) about the role of a publicist and exactly what we do.